The preferred dish of teenage mutants everywhere, pizza has been around for more than a millennia. We’ve enjoyed all kinds of pizza, from fancy thin crust restaurant pizzas to greasy deep-dish pizzas that were dripping with cheese. We like to keep a pizza or two in the freezer at all times, just in case we run into a food emergency. 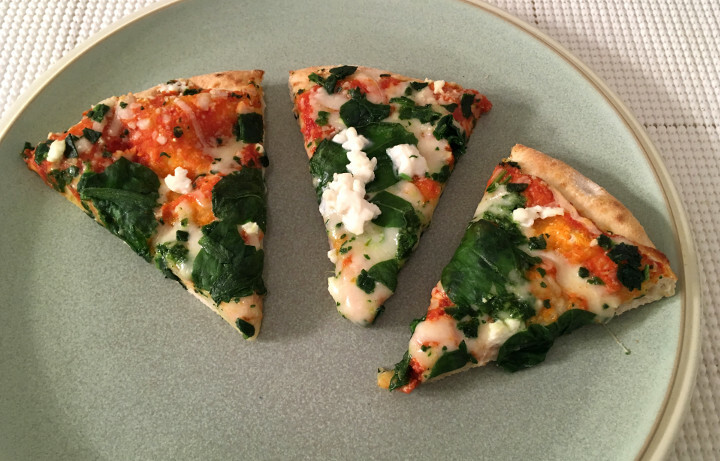 Trader Joe’s Organic Spinach & Ricotta Pizza is a treat we’ve been saving for a rainy day. 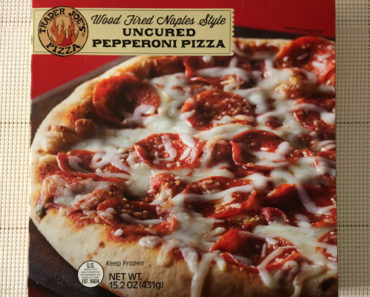 While frozen pizzas usually aren’t very complex, we found this particular pizza to be a bit of a hassle. 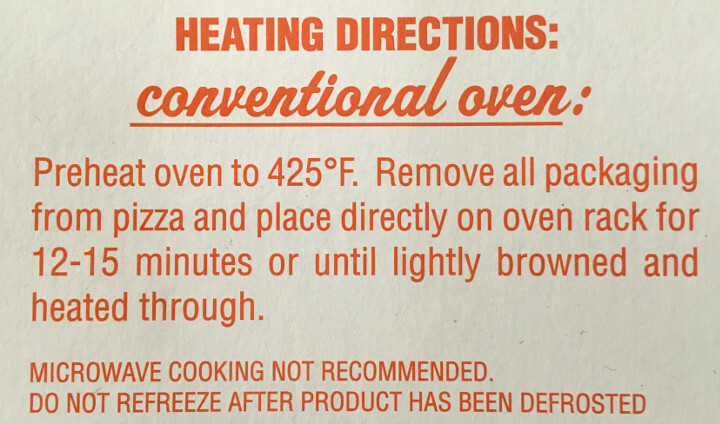 In the cooking instructions, Trader Joe’s recommends placing this pizza directly on the baking rack. However, we’ve found that doing that leaves us with a messy oven. We tried cooking it on a baking sheet instead, but our pizza was cool in the middle long after the recommend cook time had passed. 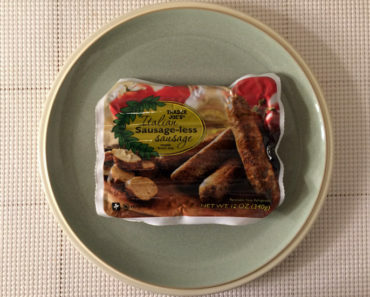 We wound up slicing it up and sticking it in the oven for a few extra minutes so that it would cook evenly. 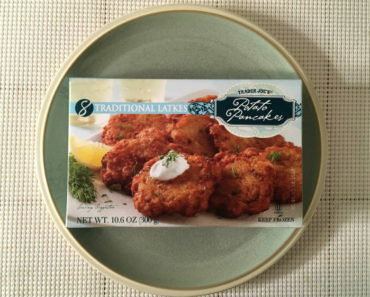 If we owned a pizza stone — or were less reluctant to clean out our oven — we might have had a better time, but as is, this gave us a headache that we usually don’t get from frozen pizzas. As you can see, this pizza is definitely on the smaller side. We wouldn’t quite call it a personal pizza — you could split this with someone else if you wanted — but it’s not going to feed a family either. 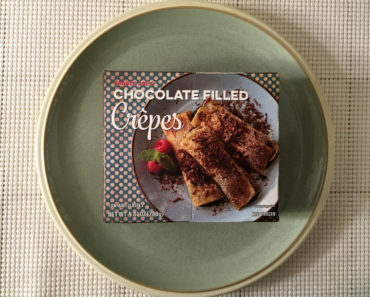 Trader Joe’s say that there are 3 servings per container, but if you’re feeding this to three people, someone is going to be hungry. We wouldn’t describe this pizza as bland, but it doesn’t have a strong flavor either. 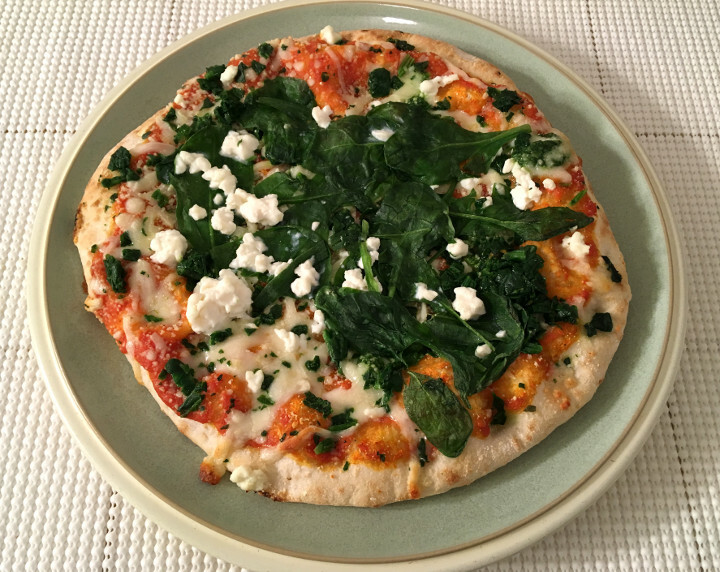 The crust in on the thinner side and the ricotta is delicate and creamy, giving the pizza an appealing taste that isn’t overpowering. The pizza is made with red sauce, but there isn’t a lot of it; we found that the cheese canceled out the acidity of the tomatoes. 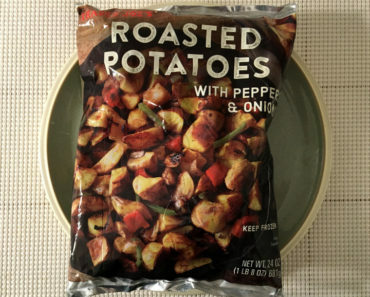 You could easily spice this up with some red pepper flakes, but if you’re in the mood for something lighter, this is a decent option. This pizza didn’t blow us away, but we did enjoy it. 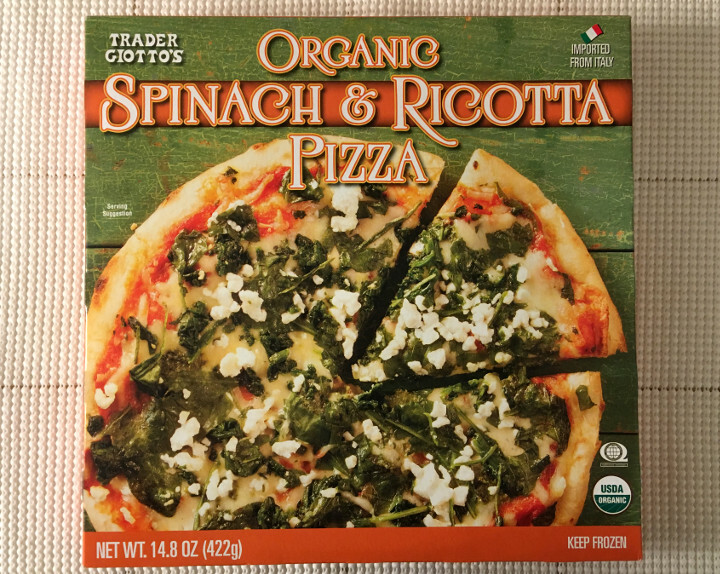 If you’re looking for a small pizza that could serve as a light lunch, Trader Joe’s Organic Spinach & Ricotta Pizza might be the meal you’ve been wishing for. 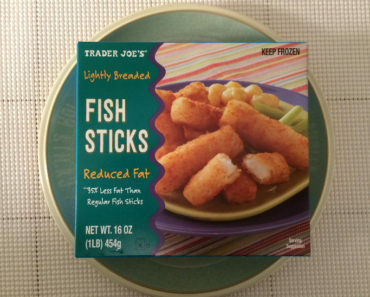 If you want something meatier or more substantial, we recommend picking up one of Trader Joe’s other pizzas instead. 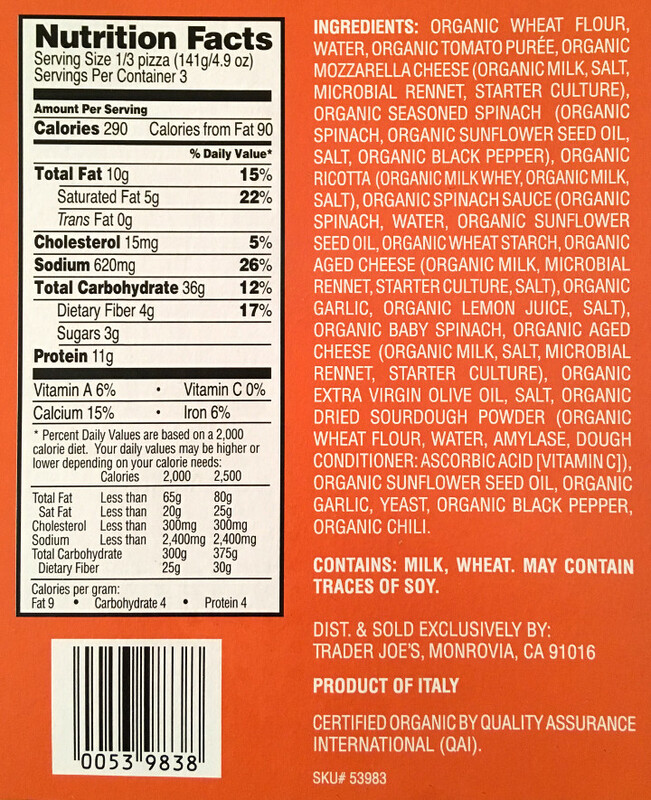 To learn more about the cooking instructions, ingredients, or nutrition facts for this Trader Joe’s frozen pizza, check out our package scans below.